JOHNSON CITY – After touring for a few years with her own band, Sally Berry had just settled into working as an adjunct vocal instructor in East Tennessee State University’s Bluegrass, Old-Time and Country Music Studies program and enjoying her home life and church activity when the bass player for her legendary mother’s band, Rhonda Vincent and the Rage, developed a polyp on his vocal cord. Berry was called to fill in, and soon toured regularly after realizing she loved life on the road. There was one thing, however, that she had never done, not even during her time as an undergraduate student in the renowned ETSU program. That soon changed, though, in 2016 when the band’s bus broke down in the state of Washington and the airline flight back to Nashville encountered some particularly bad turbulence. As it happened, the band flew a lot during the remainder of that tour, and Berry ended up writing more songs on those flights. Once she became more comfortable with writing, she began writing at home, and soon started to create music to go with the lyrics she’d penned. Berry says her mother had listened to a number of these songs, but when she sent her “Just be Still,” Vincent was particularly drawn to it. Vincent rounded up some of her friends – among them well-known Nashville session bassist Kevin Grantt, Alison Krauss & Union Station banjoist Ron Block, 2018 International Bluegrass Music Association Mandolin Player of the Year Sierra Hull, and Berry’s own husband and bandmate, award-winning fiddler Hunter Berry – and headed to the studio with Berry to record three of her original songs. The Berrys devoted all their spare time, what little there was between their demanding touring schedule with Rhonda Vincent and the Rage and their teaching responsibilities at ETSU, to the project that would become Sally Berry’s debut solo gospel CD, “God is in Control,” which was released in January and debuted at number 2 on the Billboard bluegrass chart. The first single from the CD, “Don’t Turn Me Away” (which, ironically, was never supposed to be a gospel song at all but a drinking song), hit number 4 on the Feb. 1 Bluegrass Today gospel chart. The 12-song album features the talents of a number of musicians and vocalists in addition to those who helped record the three original demos. They include two current ETSU Bluegrass, Old-Time and Country Music Program students, songwriter Dylan Young and vocalist Matthew Songmaker, as well as alumnus Brent Burke, who was the first graduate of ETSU’s bachelor’s degree program in the field. Burke, a resophonic guitarist, is also a member of Rhonda Vincent and the Rage and the husband of Berry’s sister, Tensel. Berry performed a song from the album, the perennial Christmas favorite “Mary, Did You Know?” by Mark Lowry and Buddy Greene, at the New York Stock Exchange’s 95th annual Christmas Tree Lighting in November 2018. She performs that tune frequently with Rhonda Vincent and the Rage, and was invited to share the tune at the event after NYSE officials heard her sing it at the official opening of the Grand Ole Opry City Stage in New York City’s Times Square. Berry, who holds a degree in sociology with a minor in bluegrass from ETSU, says she was prepared well for the experience of recording this solo CD by her education at ETSU, and also by touring, recording and learning the business side of the music industry with her former band, The Next Best Thing. The lineup of The Next Best Thing included her sister Tensel Burke and fellow ETSU alumna Haley Stiltner, who now plays in the U.S. Navy Band’s premier country-bluegrass group, Country Current. “A CD has so many little details – getting the music mixed and mastered, getting that sound you want to hear, picking the photos and the font (for the liner) and proofreading,” Berry says. “And when you’re used to performing in front of a crowd and you feed off that crowd, it can be really difficult to get that energy and that passion when it’s just you, four walls and a microphone. 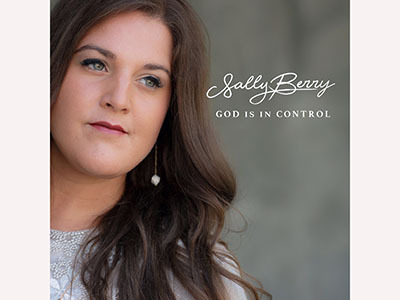 The album, “God is in Control,” is available at www.sallyberrymusic.com and www.rhondavincent.com, as well as on iTunes, Amazon and Spotify.